Beauty trends come and go every year or so; from glossy lips to makeup as skincare to beaming highlight to ombre hair... we've seen pretty much everything. Sometimes the trends lean more toward ingredients like hyaluronic acid or cannabis -- at some point in time, everyone hopes on an ingredient train. Now, there is a trend that incorporates a little bit of everything; trendiness, ingredients, and basically an entirely new category. Have you ever really thought about pollution? I mean, thought about it not in terms of breathing it in or what it'll do to your insides because I'm pretty sure we all have thought about that. I used to have an irrational fear of pollution when I was younger and was haunted by the fact that our air was so dirty. I grew out of it until I started seeing this trend pop up everywhere... now I'm obsessive about protecting my skin. Anti-pollution beauty is all about protecting your skin from environmental stressors and making sure that the pollution and grossness in the air aren't penetrating and damaging your skin. Beauty brands are starting to realize the damage that cities can cause our skin to freak out. Between trains, planes, and automobiles, the droves of people you come in contact with, and the overall dirt that is in an overpopulated city, why wouldn't your skin rebel? I have first-hand experience with this. When I started my job in 2015 and was commuting to Manhattan on a daily basis, my skin freaked out. It wasn't used to being underground, surrounded by germs and thousands of people; it wasn't used to the smog from the trains and just the overall disgusting environment that comes along with Manhattan. I broke out everywhere, mostly along my cheeks and chin, and it was very difficult to get rid of. As a teenager, I had typical acne -- a break out here and there but nothing that couldn't be dealt with by using Proactiv and Clean and Clear. I was very lucky, I know that. But now, at age 22, the city was wreaking havoc on my skin. Eventually, I got it under control and my skin became used to the stress of the city but I think I could've used some anti-pollution skincare. The key to anti-pollution beauty is to form a barrier between your skin and the environment. I've started to incorporate these types of products into my routine and I've really been loving them all. If I can see a difference, I'm not sure but I think over time, I will notice my skin being healthier and overall in better shape. When I saw this primer pop up on Sephora.com, I didn't hesitate for a minute. I purchased it immediately because it was incredibly intriguing. The Water Cloud Primer defends against pollution, environmental stressors and something I've never seen before: Bluelight! Now we have to worry about blue light affecting our skin, not just our eyes. 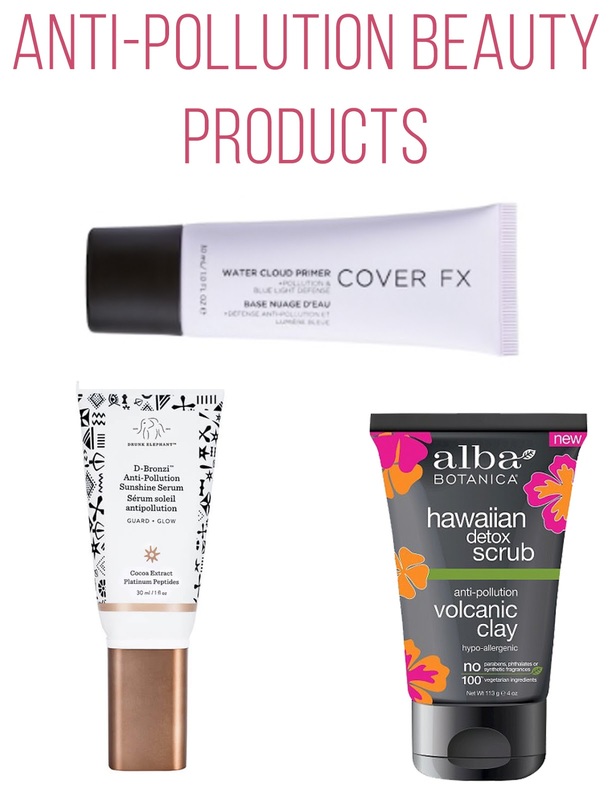 Applying this primer under your makeup will help protect your skin from all the harmful things and it's a good primer to apply when you're sitting in front of a computer all day. I've been applying this without any makeup on before I go to work just to give my skin that extra barrier. It's pretty cool and I've been loving it. I haven't used this a lot since the weather turned cold but I used it so much during the summer! The Drunk Elephant Bronzing serum made a huge splash when it launched this past summer because of its anti-pollutant ingredients and gorgeous bronze finish it adds to your skin. It contains Vitamin F fatty acids to build up a skin barrier; the mix of anti-oxidants will protect against pollution, according to the Sephora website. I love mixing this in with my Hangover RX Primer for extra moisture, protection, and a gorgeous glow. I was given this scrub in a box from InfluenceHer Collective and was so excited when I saw the anti-pollution claim. My family and I have been using this scrub for a few weeks and it's so nice. The volcanic clay leaves our skin incredibly soft and I feel good that I'm using a cleanser that is gentle enough to scrub and exfoliate my skin while also protecting against free radicals and the environment. I think you can get most Alba Botanica products in drugstores and I highly recommend checking out the rest of the anti-pollution line! They're affordable products and are made with good ingredients. What are your thoughts on anti-pollution beauty? Do you think it's a trend or necessity?